The 2017 Investment Summit may be over, but the work of attracting investment to the United States continues. So much of this work is performed by economic development organizations across the country, which offer a wealth of information and resources to guide investors through the process of establishing or expanding their operations in a specific location. And SelectUSA is also here to help, offering assistance with navigating the federal regulatory system, providing access to data and information, and connecting U.S. EDOs to investors from around the world – both directly and at events like the Investment Summit. The 2017 SelectUSA Investment Summit, June 18-20, concluded. 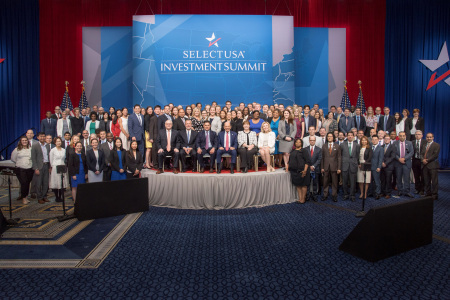 SelectUSA Executive Director Fred Volcansek looks back on the historic Summit and forward to SelectUSA’s ongoing mission: bringing job-creating investment to the United States. Summaries of Sunday and Monday be found here (day one) and here (day two). Annual event connects global businesses to U.S. investment opportunities. WASHINGTON – The Department of Commerce concluded its fourth SelectUSA Investment Summit (Investment Summit) on Tuesday, setting records for total registrations and participating international business representatives. More than 3,000 people registered for the Investment Summit, including 1,200 business representatives from 64 foreign markets. The annual Investment Summit connects global business leaders with U.S. economic development teams to facilitate U.S. investment. Two international companies announced expansions in the United States during the 2017 Investment Summit. French software company Klaxoon and multinational financial services provider Genpact both announced new U.S. business projects. The Investment Summit addressed critical U.S. business issues including infrastructure development, tax reform, and deregulation. High-level speakers included Secretary of the Treasury Steven Mnuchin, Secretary of Energy Rick Perry, Secretary of Labor Alexander Acosta, and CEOs from BMW, Siemens, GE, General Motors, and other leading global companies. Secretary Ross announced the 2018 SelectUSA Investment Summit is planned for June 20-22, 2018.